"It is important that a story ring true on a human level. Even if it never happened." Way back in 1989 the British band Pop Will Eat Itself released their understated opus This Is the Day...This Is the Hour...This Is This!, which contained the single Can You Dig It? In the lyrics of that tune, PWEI shouted their pop culture adoration for everything from Batman to Dirty Harry to Terminator, all building to the chorus that reiterated the fact that "Alan Moore knows the score." Smart guys, those PWEI-ers. Moore, for the uninitiated, is well-known as the British writer of some of the most intelligent, speculative, and genre-evolving titles in the comic book realm of the past 20-plus years, including V For Vendetta, League Of Extraordinary Gentlemen, and the masterwork Watchmen (the only graphic novel to appear on Time magazine's 2005 list of the 100 best English-language novels). And really: if you haven't read Watchmen, I urge you to do so. You'll thank me later. Moore, meanwhile, made a name for himself domestically during the early 1980s with some groundbreaking work on DC's then tired Swamp Thing title, and when Watchmen was unveiled in 1986 it was almost as if the comic world had been reborn, heralding a new era of dark writing that helped push the traditional superhero genre in a bold direction. 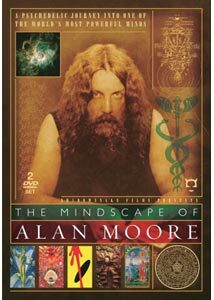 That brings us to The Mindscape Of Alan Moore, a 2003 documentary from writer/director DeZ Vylenz in which Moore is allowed to methodically expound not just on his early days and his writing, but on his own complex and psychedelically scholarly view of human evolution, magic, religion, and the power of information. That's a pretty heady mixture for a 78-minute documentary, and Vylenz intercuts footage of the Ent-like Moore, with his elaborate finger rings, calmly discussing a variety of connected topics with a batch of stylized visuals and a complimentary electronic score from Drew Richards, Bill Laswell, Alan Douglas, Lustmord, and Spectre. The result is a package that has the potential to be, well, just ridiculously full of itself, but yet somehow comes out as a smart and compelling peek under the mental hood of an especially talented writer of speculative fiction. Surprisingly the bulk of the material here is not solely about Moore's writing, but instead builds on his belief system and his thoughts on what the future may hold for humankind. And that's really where the needle of the BS meter could have just gone out of control, because as Moore mixes his own occultist/shaman values with science and religion, the content suddenly shifts toward a layered narrative theme where things like morphogenetic fields, "ideaspace," and what he believes is an imminent "flashpoint of knowledge" in 2015 all converge. His delivery is quiet and eloquent, and however esoteric the content may become, it all is presented with the loose formality of college lecture by one of those hipster professors with all the crazy ideas. Moore is more than just a comic book writer, and his rather complicated psychedelic science teachings will either bore or fascinate you, depending on where you fall on that spectrum. It might be easy to laugh off his sometimes bizarro thoughts if you're not familiar with his rich body of work, and a film like this is clearly for the Moore faithful. Vylenz makes the potentially dry presentation compelling, avoiding making a traditional "talking head" doc, and Moore himself paints his ideas with the kind of expanded thinking I would have expected from the mind of the guy who wrote such literary benchmarks such as V For Vendetta and Watchmen. Image Transfer Review: Disinformation has issued Vylenz' 2003 doc in 1.78:1 anamorphic widescreen. Fleshtones and colors appear generally warm and natural. There are frequent bouts of nicks and specking throughout, and I'm not entirely sure if they were purposeful "artistic" touches or mild imperfections (I lean towards the latter, however). Some minimal compression flaws are also evident, but their presence was not a major hindrance. Audio Transfer Review: Two audio choices, either 5.1 surround or 2.0 stereo. Naturally I'd suggest opting for the 5.1 track, where the constant synth noodlings of the trippy electronic score get a larger, more substantive aural texture. Both tracks deliver Moore's eloquent narration cleanly and clearly, but the soundtrack gets a lift from the multi-channel blend. Extras Review: There's an impressive set of extras for this two-disc set, which comes packaged in a Scanavo case (both discs housed on one panel) inside of a side-opened slipcover. A glossy 20-page booklet takes up the other panel, and features an introduction by celebrated fantasy/sci-fi author Michael Moorcock, and a lengthy article by writer/director DeZ Vylenz discussing the intricacies of the project. Disc 1 carries the feature, cut into 30 chapters, and available with optional subs in English, French, Spanish, or Portuguese. Vylenz also provides commentary for seven sequences in the doc (V For Vendetta, Watchmen, The Job Of The Artist, The Rise Of Monotheism, Act III, The Morphogenetic Field, Finale) though for some curious reason these are only accessible via a menu option, and not during a viewing of the film itself. As I'm sure is the case with many fans of Moore, it was sort of neat to hear Vylenz' discussion of those beautifully dark opening pages of Watchmen�and how it struck such a powerful chord with him. I can relate, brother. Also on Disc 1 are four bonus segments, each covering an element of the production. Making A Mindscape (11m:47s) is basically an overview piece, a narration free bit of on-location behind-the-scenes footage covering the shooting and staging of a few key moments from the doc, including the Rorschach/rooftop/Watchmen scene. Director Interview (15m:45s), where Vylenz is credited as "writer/director/martial arts choreographer," provides more of his initial immersion into comics, Moore and the film itself. Special FX Artist Interview (11m:24s) is a chat with Brian Kinney, who shows how he made the V mask, as well as the lumpy Swamp Thing-influenced mass of what he refers to as an "organ/plant/animal" thing. Composer Interview (18m:40s) features Drew Richards, and in a pleasantly long interview covers his personal background, and how that evolved during the scoring of Vylenz' doc. Composers usually get the short shrift on DVD extras, and it was nice to see Richards get an interview that ran longer than the director. Concluding Disc 1 are two trailers for the film, each showcasing different score elements. Disc 2 is a real delight for comic fans, as it holds six in-depth interviews (five with Moore collaborators and one with a comic book historian). The segments featured are with Lost Girls artist/Mrs. Alan Moore Melinda Gebbie (31m:06s), Watchmen artist Dave Gibbons (27m:46s), comic book historian Paul Gravett (28m:20s), V For Vendetta artist David Lloyd (13m:18s), League Of Extraordinary Gentlemen artist Kevin O'Neill (19m:59s), and Promethea/Mirror Of Love artist Jose Villarubia (18m:42s). The scope of the material looks at more than simply their involvement with Moore, but at their own comic book history as well. The whole thing plays like another documentary entirely, and is almost worth the price of admission on its own. Aside from a sometimes sketchy video transfer, this two-disc set is chock-a-block loaded with the intelligent speculation of Moore, buttressed by Vylenz' hip-and-inventive-on-a-budget visual style. Disc 2 carries even more insight from some of the comic world's renowned names. Alan Moore does indeed know the score. Highly recommended.